Self contained cabin accommodation and glamping eco tents on 5 peaceful acres of farmland. All styles of accommodation offer peace and privacy with spectacular panoramic views of the Wilsons Promontory mountains and farmland. When the sun goes down, sit out on the veranda, cook a meal on your BBQ, watch the alpacas graze and witness beautiful sunsets across the countryside. In the morning, wake to bird-song and stunning sunrises, brew a coffee using your Expressi Coffee Pod Machine, what a perfect way to start the day! 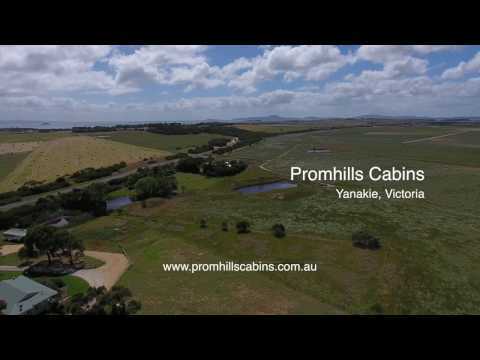 Escape the hustle and bustle of the city life and enjoy the peaceful surroundings that Promhills Cabins & Glamping in Yanakie has to offer. Promhills is private and peaceful, close to pristine beaches and a range of activities and attractions. Yanakie is centrally located, only 5 minutes to Wilsons Promontory National Park and within easy driving distance to Tidal River, Foster, Fish Creek, Sandy Point and Waratah Bay and a pleasant day trip to Phillip Island or Tarra Bulga National Park.